I don’t meditate and I don’t go for weekly massages to unwind. Years ago, I discovered something much more cost-effective to help me relax: fountains. Even as a condo dweller I enjoy a small two-tier rock fountain that I picked up a few years ago at a home improvement store. There is something soothing, almost magical, about the gentle trickle of water as it pushes out the noise of the world. It’s not just style and price: Before you choose a fountain style—of which there are many—consider the material it’s made of. Fountains come in everything from stone, copper, and bamboo to synthetic materials like acrylic resin and fiberglass. Before you fall “head over heels” for a certain look or price point, make certain the fountain you select can withstand the climate conditions in your area. 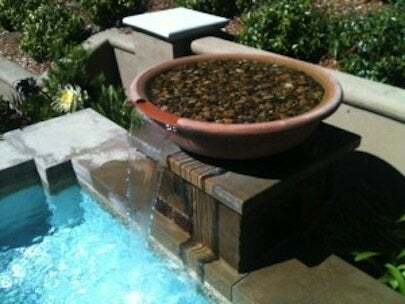 Pre-assembled or DIY: Do you want a fountain that requires you to only find a location and outlet, or are you looking for a do-it-yourself project? There are a good many sources for pumps, parts, and how-tos, but a bit of plumbing and electrical know-how will be required for the latter. Be sure to follow manufacturer instructions closely. Electric vs. Solar: Since most fountains run continually to prevent standing water, consider new solar-powered models. They will operate just the same but save you a little in extra utility costs. Fountains are not a huge drain on utilities, but even minor savings are always welcome. Maintenance and care: As fountains recirculate water, a certain amount of evaporation will occur. To keep the pump operating efficiently, be sure that the water level remains at the required level. You can use regular water from a garden hose to fill your outdoor fountain (indoor fountains require distilled water), but think about adding an algae treatment to prevent growth and build-up. In colder regions, fountains should be drained of all water for the winter (with the pump stored indoors). Stone and ceramic fountains should also be brought indoors to avoid cracks and other damage caused by severe temperature fluctuations.